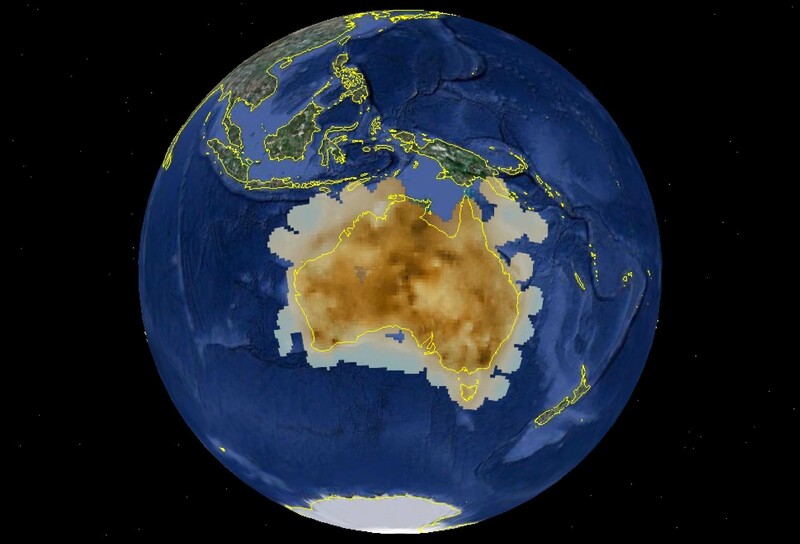 The Australian continent is relatively well covered with both active and passive seismic techniques. Multiple sources of information are therefore available for building a model of Moho depth. Results from on-shore and off-shore refraction experiments are supplemented by receiver functions from a large number of portable stations and the recently augmented set of permanent stations. Moho picks from more than 10,500 km of full-crustal reflection profiles provide valuable additional constraints. 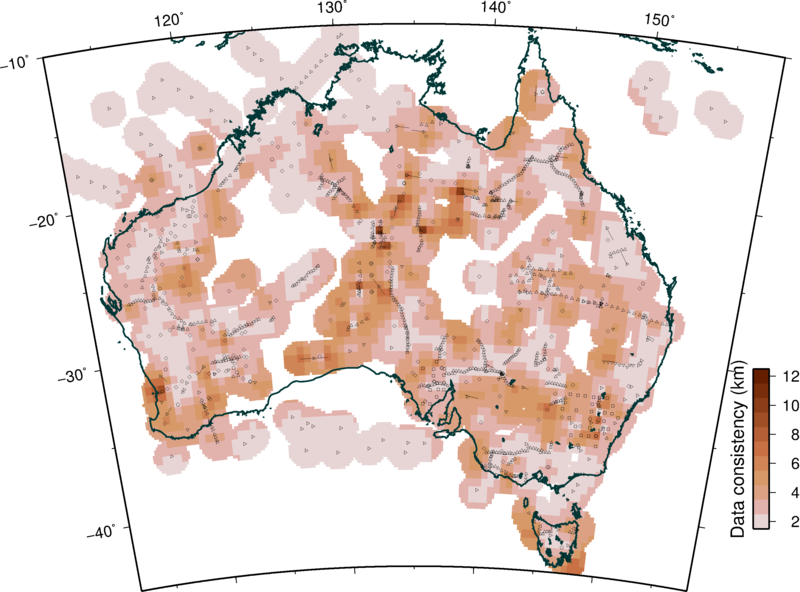 The composite data set provides good sampling of much of Australia, though coverage remains low in some remote desert areas. The various datasets provide multiple estimates of the depth to Moho in many regions, and the consistency between the different techniques is high. Some of the thinnest crust lies beneath the Archean craton in the Pilbara, and in the neighbourhood of the Simpson desert. 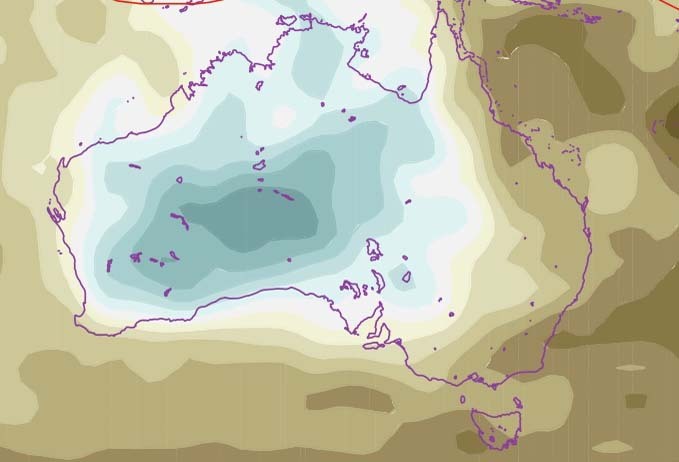 Thick crust is encountered beneath parts of the Proterozoic in Central Australia, and beneath the Paleozoic Lachlan fold belt in southeastern Australia. 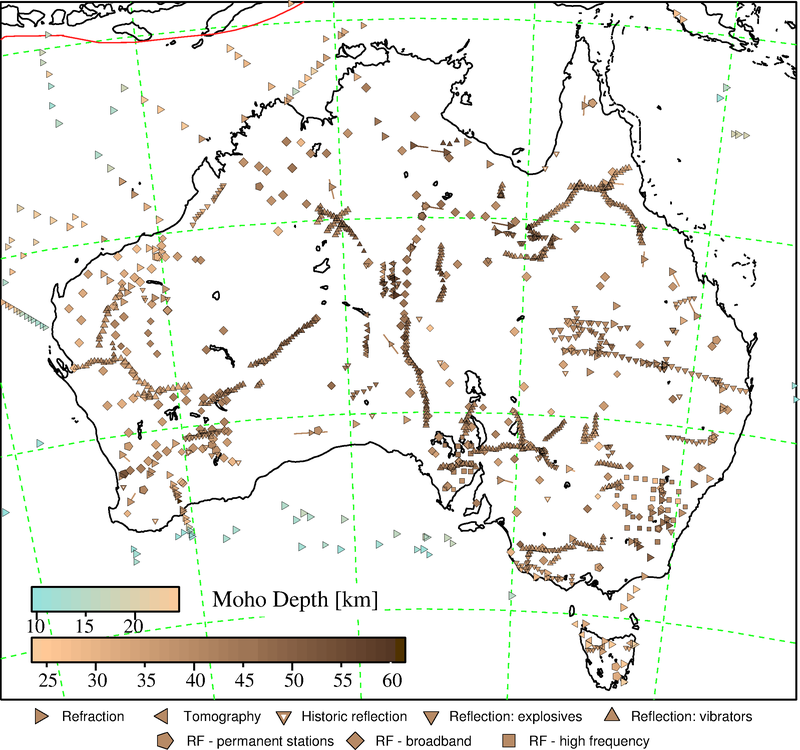 There are a number of zones of sharp contrast in depth to Moho, notably in the southern part of Central Australia. Moho surface constructed from the full set of estimates displayed above. The surface is constructed by interpolating weighted averages for each 0.5° x 0.5° cell, the size of the pixels in the image. The original results are superimposed on the interpolated surface using the same colour coding, shown at the right with depths in kilometres. 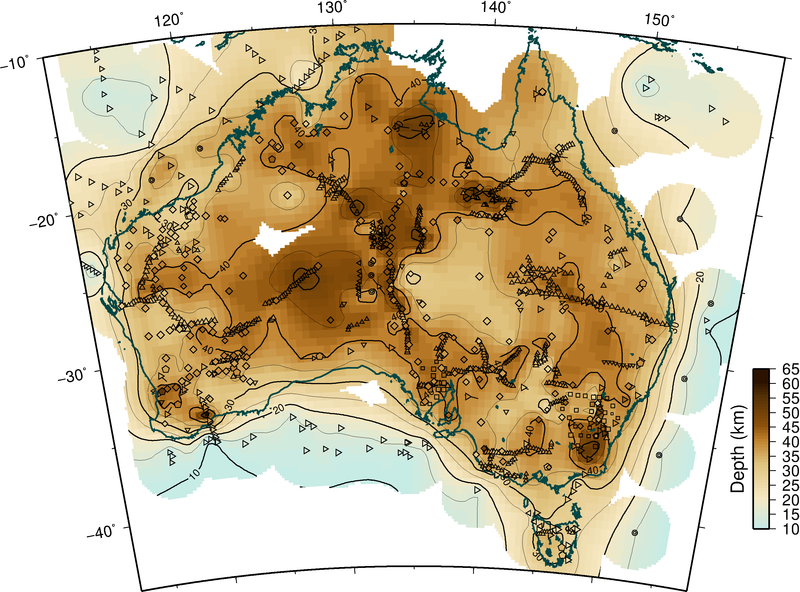 Additional control points based on the gravity analysis by Aitken (2010) are indicated by double circles; these extra points, applied with low weighting, help define features with strong directionality and constrain, to some extent, the continent-ocean margin to the east of Australia. For the Google Earth version click on the image above. For grid files go to downloads. Map of consistency of the Moho depth estimates from the different styles of data. The influence of the points is allowed to extend to a radius of 125 km. Where multiple estimates occur in a single pixel the weighted standard deviation is plotted. Where there is only a single estimate in a pixel the consistency value is calculated as 12*10w, where w is the weighting applied to the data value, a minimum value of 2 km is employed where two values in a pixel agree.